That's right. It's MILA 2.0 author Debra Driza. We talked about things like current Hollywood crushes to favorite books and even the song she'd pick if MILA 2.0 were made into a movie. Without further ado, here's Debra! 1. I noticed you have a playlist for the book on Goodreads. If MILA 2.0 were to be made into a movie, what song would you pick for the movie trailer? Oh, gosh, that’s hard. I feel like I need multiple songs to capture the feelings of different parts of the story. I might be tempted to go with something like Army of Me by Bjork, because it’s exciting and jarring and would capture Mila’s badass side (plus, love that song!) If I were going for campy, then I’d definitely consider More Human Than Human by White Zombie. 2. If you were created in a lab, what superhuman abilities would you want to have? I would love the ability to pack nine hours of sleep into two or three. Also, I could use some superhuman—or even normal human—organizational skills. I am woefully challenged in that department! I’d also dig being able to do those urban warrior-type stunts. I can’t believe how they just climb walls and make it look so easy! Wow, that’s a seriously tough question! I’m super random and have no qualms about acting like a giant goofball in public, but I’m also innately cautious when it comes to dangerous things—no sky-diving for me. Oh, but I did jump off the top of the Seven Falls in Maui when I was a youngster—which was pretty crazy, considering I don’t see all that well and apparently almost hit a rock! (My mom was thrilled) I also attended Burning Man last year, which most of my non-writer friends consider to be loco since you’re basically roughing it in the middle of the desert for a week with 40,000+ strangers. 4. What is the craziest thing you have ever eaten? I was the pickiest eater for a really long time, so I’m still making up for lost years. That said, my hubby’s family is Czech, and I did sample Sulz one year—which is something like head cheese and gelatin combined. Bon appetite! Favorite candy: Probably Skor bars. Or anything chocolate, really—unless it has nuts. I like nuts and I like chocolate, but they have to remain separate. Coffee or tea: Tea! Iced or, my fave, chai lattes! I rarely drink coffee as the massive doses of caffeine make me spaz out. Trust me, this is a bad thing. Cats or Dogs: Dogs. Too many dogs. Dogs that hog the bed, dogs that steal my food. I’m surrounded by naughty dogs. Favorite restaurant: So tough! One place that I will always remember fondly for comfort food is Snuffer’s back in Dallas. Cheese fries, MMMMM. Also, pretty much anywhere that has good chips and salsa. Favorite Book: Impossible to name just one! But two of my all-time favorites are Brideshead Revisited and Fletch. Hollywood crush: You know, I don’t really crush on actors for looks—more on characters and personalities. Back in the day, I would have said Spike from Buffy. Now? I guess I’d have to say—Jennifer Lawrence. I love what a total goober she is! Debra, thank you so much for taking the time to answer these questions for us. 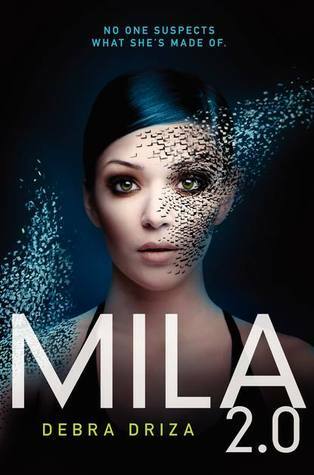 Don't forget, I'm giving away a signed finished copy of MILA 2.0 so be sure to enter. Believe me, you don't want to miss out on this opportunity! And now I want cheese fries for lunch. LOL! Awesome interview, Lena! Hi, I only just discovered your blog but I’m liking it so far. Great interview! I'll be sure to check out more in a minute.